A crafty college student named Brian Kerr networked his way into a phone meeting with me back in March — I was impressed by his chutzpah (I welcome cold-calls from ambitious folks!). However, what really impressed me was the “thank you” letter he just emailed sixteen of us — that’s right, he talked to 16 people in his job searched and thanked us all. This thoughtful thank you letter (full text below) made my day! I’m blown away by the tenacity and professionalism of this young man: He even included details about why each of us were valuable to him in his job search. 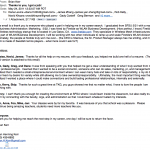 I’ve included the email below (with his permission)…we have a lot to learn from this man. His email is more thoughtful than ones I receive from most “professionals” with decades of experience! Subject: Thanks to you, I got a job! This email is a thank you to everyone who played a part in helping me in my career search. I graduated from SFSU 5/21 with a major in Business Administration: Marketing. 5/22, I was hired by Firetide as WLAN Business Development. (How perfect, I know) Firetide is a Wireless technology startup that is located in Los Gatos, CA. They specialize in Wireless Mesh infrastructures. As part of WLAN Business Development, I will be working with two other individuals to ramp up and scale Firetide’s WLAN division. Rob, Gady, Greg, and Dana: It was from speaking with you that helped me get a clear understanding of what I truly wanted from my first professional job. I learned that I wanted to be a social connector, someone who can do sales, marketing, pr, and management. I realized that I needed a small entrepreneurial environment where I can wear many hats and take on lots of responsibility, so I can feed my desire for variety while still allowing me to take ownership/responsibility. Ultimately, the most important thing was that I realized I wanted a place where I could make connections and build lasting professional relationships, internally and externally. Jon, Kerry, Skip: Thanks for such a great time at TKG, you guys showed me that no matter what, I have to love the people I am working with. Nancy: I can’t thank you enough for creating the environment at SFSU where I could learn inside the classroom, but also really truly learn by connecting with the faculty, orgs, and administration so that I could learn whatever fueled my interests. Don, Anne, Foo, Mike, Jan: Your classes were by far my favorite. It was because of you that school was a pleasure. Please continue being amazing teachers, students need more teachers like you. Thank you for helping me reach the next step in my career, one day I will be sure to return the favor. What Does A Toastmasters Agenda Look Like? Some of you want to know what a typical Toastmasters meeting looks like. Here’s a sample Toastmasters agenda (it assumes a 12:05pm start with a roughly 1pm close (total of 55 minutes for the meeting)). For more on Toastmasters basics, check out My First Experience With Toastmasters. I’ve had a couple of smart friends recommend that I check out Toastmasters as a tool to sharpen my public speaking saw for a few years now…so I finally took the plunge. I highly recommend that you try it out — you can find one of 12,000 Toastmasters locations in 130 countries. Toastmasters International is a non-profit (though they do charge you if you want to be a member) that began in Santa Ana, California in 1924. I picked a Toastmasters club in San Francisco (there were a dozen to choose from! )…coincidentally, one of them was located in a building I used to work. You don’t need to pay anything to check it out. You can be a free guest for as long as you want which allows you to both observe others giving speeches and also give your own short speeches (I’ll explain what guests do in a moment). If you’d like to become a member (which means you’ll receive some curriculum and the opportunity to do longer speeches (and get feedback on them), the Toastmasters dues are $20 one-time and then $27 every six months. Do I have to give a speech at the first Toastmasters meeting? Yes, though it’s a short one. At your first meeting, you are asked to stand up and introduce yourself and how you came about choosing Toastmasters. You will also have the option to do a Toastmasters table topics speech at your first meeting. What is a Toastmaster table-topics speech? A Toastmasters member at each meeting will give guests a random topic or theme for a speech (called a table-topic) and the guest is asked if he or she would like to speak about that topic right there on the spot (without preparation) for a couple of minutes. Table-topic speeches are designed to help you think on your feet — my first table-topic was a college graduation commencement speech. What are the different Toastmaster parts/roles that people play? Toastmaster Grammarian — They give a speech on what the Grammarian does (which is to count how many times speakers say words such as “like” or “uh”) and give a Grammarian’s Report speech of all Speakers. Toastmaster Timer — They give a speech on what the Timer does and another speech on how much time each Speaker took. Toastmaster Guests — They give a brief speech (standing up behind their chair) about how they learned of Toastmasters. Toastmaster Speaker — They give a speech on some topic that they were given a week or two earlier. Toastmaster Evaluator — They give a speech on the Toastmaster Speaker. Note: Every single person in attendance at a Toastmasters meeting is asked to speak (you may decline) and every person is there to learn (there are no Toastmasters employees in attendance!). How frequently do Toastmasters meetings take place and how long are they? Toastmasters meetings are typically weekly for one hour. But you’re under no obligation to attend every one (I attended my first three over a two-month period (because I was traveling). 1. Know your material. Pick a topic you are interested in. Know more about it than you include in your speech. Use humor, personal stories and conversational language – that way you won’t easily forget what to say. 2. Practice. Practice. Practice! Rehearse out loud with all equipment you plan on using. Revise as necessary. Work to control filler words; Practice, pause and breathe. Practice with a timer and allow time for the unexpected. 3. Know the audience. Greet some of the audience members as they arrive. It’s easier to speak to a group of friends than to strangers. 4. Know the room. Arrive early, walk around the speaking area and practice using the microphone and any visual aids. 5. Relax. Begin by addressing the audience. It buys you time and calms your nerves. Pause, smile and count to three before saying anything. (“One one-thousand, two one-thousand, three one-thousand. Pause. Begin.) Transform nervous energy into enthusiasm. 6. Visualize yourself giving your speech. Imagine yourself speaking, your voice loud, clear and confident. Visualize the audience clapping – it will boost your confidence. 7. Realize that people want you to succeed. Audiences want you to be interesting, stimulating, informative and entertaining. They’re rooting for you. 8. Don’t apologize for any nervousness or problem – the audience probably never noticed it. 9. Concentrate on the message – not the medium. Focus your attention away from your own anxieties and concentrate on your message and your audience. 10. Gain experience. Mainly, your speech should represent you – as an authority and as a person. Experience builds confidence, which is the key to effective speaking. A Toastmasters club can provide the experience you need in a safe and friendly environment. I hope you try Toastmasters out — I’d be surprised if you didn’t find it a super-positive experience. When you are in conflict- or crisis-mode, the tendency is to get emotionally charged and that sometimes leads to folks taking actions that are unhealthy for the business. A good communication about conflict should focus on the underlying problem (not the person). Don’t assume there is just one solution. And it doesn’t have to be your solution versus your team’s solution. 3) Insist That Results Be Based On Some Objective Standard. That way, you and your team can measure how you get out of the crisis/conflict. It’s better to pause, collect your thoughts first and even talk to a colleague if you can…then start writing when you’re more calm. Your communication will now be more effective.